Crazy for You is an award winning, fast moving show, packed full with romance, comedy & lively dancing. Winning ‘Best Musical’ when it opened on Broadway in 1992 and a year later in the West End it won ‘Best New Musical‘. This great Gershwin musical has many well-known and familiar numbers such as ‘Someone to watch over me’, ‘I got rhythm’ ‘Tonight’s the night’, ‘Naughty Baby’ and ‘They can’t take that away from me’. True to recent form, TMTG has assembled a strong cast for the show featuring; Gary Kennedy in the role of Bobby and Emily Costa as Polly. Please select the ‘Cast’ button on this website to find out more about those in the show, and hit ‘Get Tickets’ for ticket information and to buy your tickets now. Set in the 1930s, Bobby Child is a talented song & dance man, longing for a life in the theatre. However, as the son of a wealthy New York banking family, he’s sent away on business to the run-down, Western gold mining town of Deadrock, Navada by his domineering mother to foreclose the Gaiety Theatre. Once there, in spite of having a debutant fiancé back in New York, he falls in love at first sight with the feisty Polly, the daughter of the theatre owner. But failing to impress her, he dreams up the idea to put on a magnificent show to raise money for the theatre in order to save it. The elaborate plot involves Bobby impersonating Bela Zangler (an established New York producer) & inviting the glamorous dancing follies to support his scam and cast of singing, dancing cowboys. All this goes awry as on opening night no-one comes to see the show. Then Irene (Bobby’s fiancé) turns up, followed by the real Zangler. Bobby reveals the truth to Polly who can’t forgive his deceit. The path of true love rarely runs smoothly, but the town is reinvigorated, the theatre is saved, and eventually the two resolve their differences to provide a very happy ending. With less than 3 weeks until opening night it's time to rally friends and family and book your tickets now before it’s too late. The show promises to be a spectacle, full of love, comedy and some lively dance numbers and songs you will recognise: Someone to watch over me, Nice work if you can get it, I got Rythym, They can’t take that away from me, to name just a few. Following our successful and enjoyable Event day on Saturday we will be starting rehearsals for Crazy for You this Wednesday evening at Tytherington Hall. After a long and difficult audition session in May (we really have such a talented company) the show has been cast and we are looking forward to a lot of fun and a fantastic show under the direction of Heather Collins. Unfortunately we are no longer able to accept new members for this production. TMTG is appealing for men aged between 20-35 who can sing and tap dance to come forward now. TMTG who rehearse in Tytherington, South Gloucestershire and perform at the Armstrong Hall, Thornbury have a group of talented female members who need more toe-tapping males for them to perform with. If you fit the criteria and are available to perform on 22nd - 25th October and can attend rehearsals on Mondays and Wednesdays then contact our membership secretary. 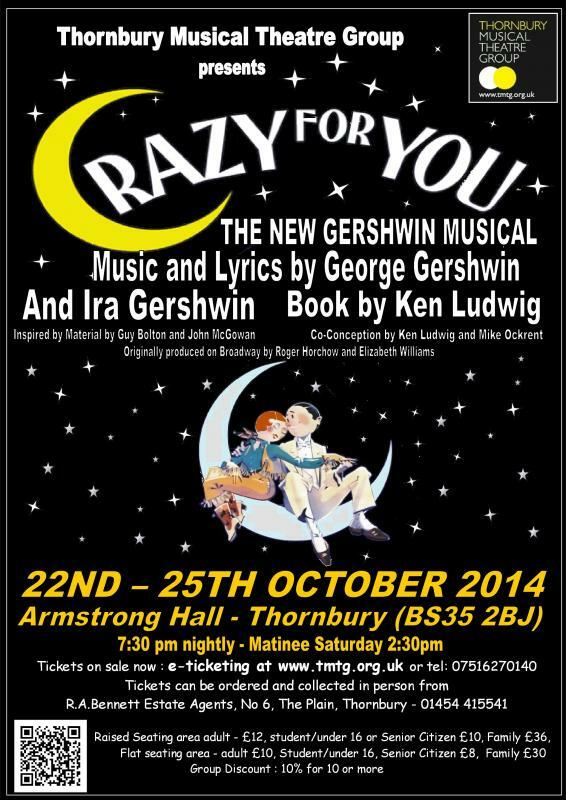 Our main show for 2014 will be 1992 Tony winning Gershwin musical comedy ‘Crazy for You’. Following her magnificent directing debut with Beauty and the Beast in 2012, we are delighted that Heather Collins will be directing this show supported again by Kara Kennedy as choreographer. A thoroughly entertaining but challenging show, TMTG will be looking to attract new members, particularly men with dance experience. Congratulations to all on being awarded the NODA South West District 15 award for Achievement for Crazy for You. The awards ceremony is on Saturday 28th February at the Bristol Marriott when we will receive our cup and certificate.